SoftPLC version 4.6 is a major upgrade that also includes a major upgrade to Gatecraft Linux (the operating system on your SoftPLC's). The key enhancement was a restructuring of how we build the system, which adds a "Package Manager" capability. This provides an easy remote upgrade capability for your SoftPLC's. If you are not familiar with Package Managers, you can learn about them at http://en.wikipedia.org/wiki/Package_management_system. We will be establishing a repository on the internet from which customers under support will be able to get updates to SoftPLC, Gatecraft Linux, and also TLM's such as drivers and new loadable instructions. 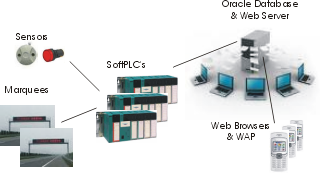 The SoftPLC Programmers Toolkit has also been upgraded to support SoftPLC version 4.6. Contact SoftPLC technical support at support@softplc.com for more information on the upgrades and procedures to update your products. SoftPLC systems are being used for a city-wide parking lot information system in Taipei, Taiwan. SoftPLC controllers monitor each public parking facility and continuously keep track of open parking spaces. Scrolling marquee signs located at important road intersections display parking space availability at nearby facilities. The information is also updated at the city's web server, and drivers can check the parking lot information with a mobile phone through WAP service. A java interface between the SoftPLC's at each parking lot and the Oracle database that provides the website information was a key part of this system. We have an online News Feed for posts on updates, new add-ons, features, etc. Our News Feed is available via RSS. Click here for the link.